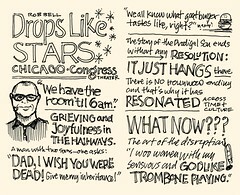 In May, I was invited by Rob to come sketchnote the Chicago Drops Like Stars kickoff event and gladly accepted the opportunity (and challenge) of capturing Rob live. My wife, two friends from my church and I took a road trip to Chicago on Wednesday night and had a great time experiencing Rob in the old Congress Theater. Sketchnoting the event was challenging: lighting was dim and it was hot, but as I got into the flow, the light, the heat and humidity faded into the background. One happy side-effect of the dim lighting and humid conditions in the Congress is a looseness to the sketchnote quality. 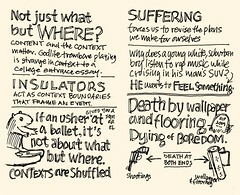 Normally I work in well-lighted, comfortable conditions, which produce much tighter sketchnotes. 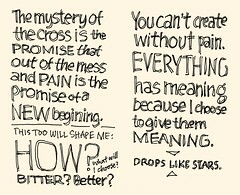 Rob Bell, for those who may not know of him, is the pastor of Mars Hill Church in Grand Rapids, Michigan. He's also been the featured presenter in the Nooma series of short videos and is currently on a world tour presenting Drops Like Stars, talking about the connections between suffering and creativity. 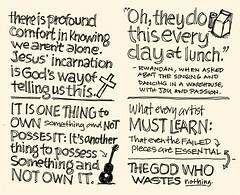 Rob is one of my favorite speakers and a great storyteller. I find His unique way of sharing messages from the Bible with relevance to my life today and in context with the ancient cultures and tradition when the scriptures were written, fascinating. 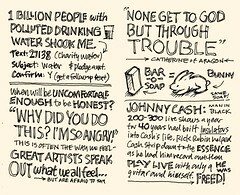 Rob, thanks so much for inviting me to sketchnote your talk in Chicago, I had a great time. I hope you and others thoroughly enjoy the sketchnotes! I love the Nooma series. We watched them in my small groups during youth group when I was in high school. They were so challenging and wonderful. I love your style! It's so neat how you take notes. I recently started journaling in a sketchbook rather than on lined paper to try to give myself a bit more free flow, but it hasn't worked yet. I enjoy looking at your sketchnotes, and also looooved your Moleskine hack! I finally found a todo list system that works for me, and a lot of it had to do with seeing your hack. Tara, great to hear you had a good experience with the Nooma videos. My experience with them has been the same -- I enjoy them very much. Thanks for the kind words on my sketchnotes! I hope you keep on trying out the sketch approach, and sketchnoting ideas. I think it's a matter of continuing to do the process to improve in it: doing makes you get the flow down. Don't give up! And great to hear my hack of the Moleskine was helpful! I'm glad to hear it's working for you! Thanks, so much for doing this. It has really helped me re-capture the experience and the journey of this revolutionary talk. Dave, you are very welcome! It is for just this reason I love capturing sketchnotes: to help those who were there remember things better and to help those who weren't there to get a better idea of what an event was like.